2-part class. 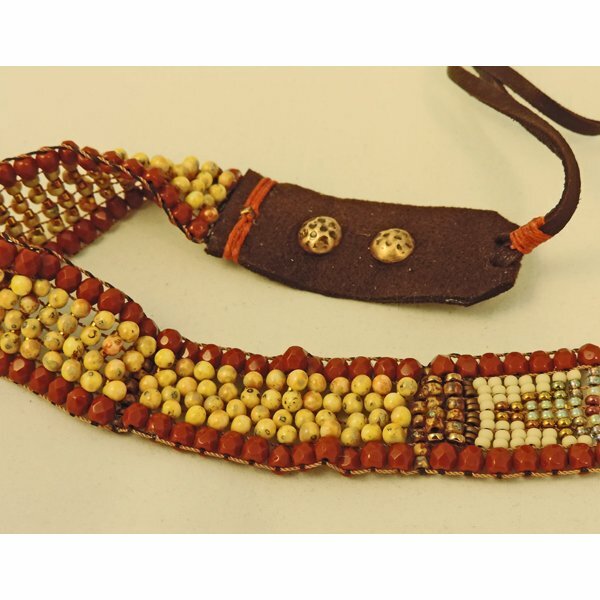 Add this Southwest beauty to your fashion wardrobe. Take part one with Rose Mary to revisit “old school” looming. Learn the art of mixing bead sizes and types to make this outstanding choker. Finish up with Dessie by adding suede, leather and other eye catching details. As a bonus, Dessie will help you make a coordinating bracelet. Dessie & Rose Mary may offer more than one class on her teaching days. The first two students to register determine what is taught that day. If you register on line we will call you to confirm your choice. Note: Our flexible schedule means that recent changes at the shop may not be reflected on line! Please don’t sign up on the website a day or two before class--give us a call to make sure there is a class and that there is room for you. Thank you.